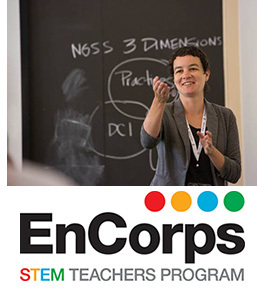 The EnCorps STEM Teachers Program is a nonprofit organization whose mission is to help science, technology, engineering, and math (STEM) professionals get involved with deserving middle- and high-school students from under-resourced communities. We are dedicated to increasing the number of science and math teachers and tutors throughout California; we currently support the Bay Area, Sacramento, Los Angeles, Orange County, and San Diego. We have plans to expand to other regions and states soon. EnCorps is an easy way for you to get involved in STEM education and even explore a career in teaching if you'd like! Our STEM Expert Tutors volunteer a couple hours a week to tutor students in math and science. Our Credential Track Educators also volunteer as tutors and guest teachers, but additionally receive support in obtaining a teaching credential and finding a position as a full-time middle- or high-school teacher. In either track, participants in EnCorps volunteer their time to work with under-resourced students to increase their math and science knowledge and skills and to help students learn to become problem solvers, innovators, creators, and collaborators. EnCorps is free to our educators, but you must apply to participate in our program. To qualify, you must be in a STEM profession (which includes all the astronomical sciences, of course) with at least 3 years of full-time STEM-related work experience; you must be fully eligible to work in the United States; you must hold an undergraduate degree with a GPA of 2.50 or higher; you must not already hold a California teaching credential. We are conducting interviews throughout the spring for STEM tutors and the credential pathway. Only applications submitted by the application deadline will be considered. We have a limited number of open spots and accept candidates on a rolling basis; it is in your best interest to apply early! All accepted candidates will begin our program in June. Apply now for consideration into our 2015 cohort! You may also contact Bethany Orozco, EnCorps Southern California Program and Recruitment Director, at 310-293-9220. Find out more by joining one of our free EnCorps 101 webinars on 7 May at 12:00 noon PDT (3:00 pm EDT).